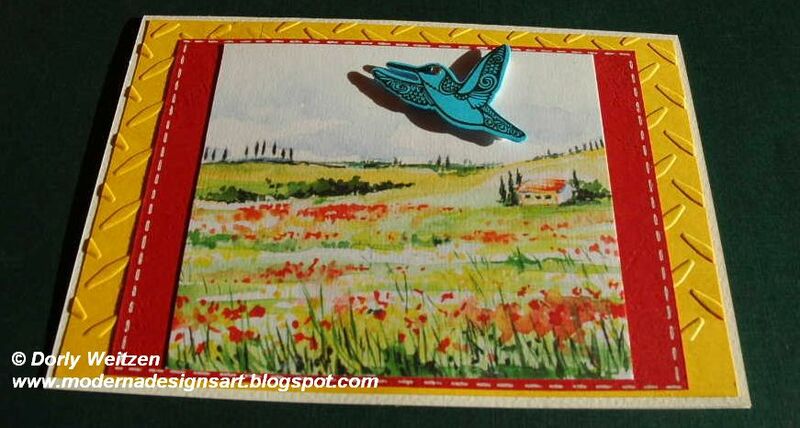 Here's a card I'm sharing as your Card Captain today for the enjoyMichaelStrongstamps Yahoo Group. 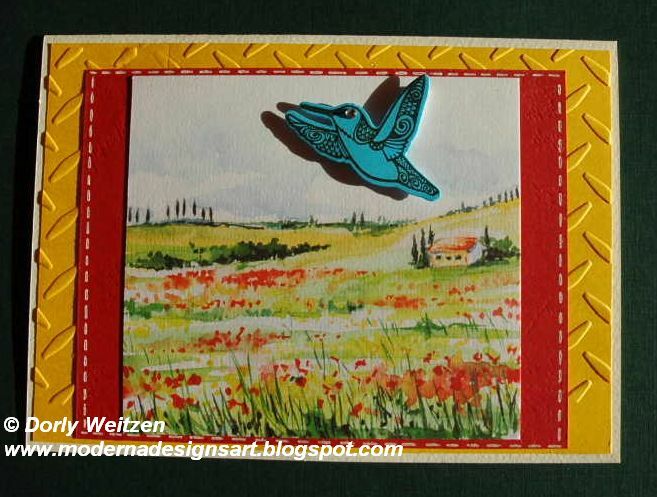 I created this card in vivid, primary colors, to enhance nature and its sheer beauty. I love the tiny Hummingbird, which is flying high above the fields. Things must seem different from the bird's point of view. Don't you sometimes wish you could fly? I chose this Aqua painting, printed on heavy white canvas textured CS, as the main focal point of the card. Can you feel that spring is in the air? 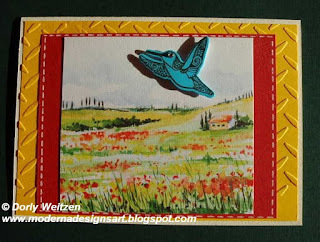 I used yellow paper (recycled from a magazine) with the Cuttlebug Embossing Folder - Diamond Plate - as my main background. 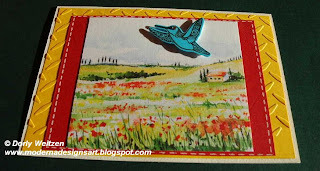 This embossing resembles the tracks left by a tractor plowing the field, which fits the painting (artist unknown, taken from an advertisement). Then I layered the red leather textured CS, and then the CS with the Aqua painting. I added faux stitches, using a white Gel pen. I stamped Michael Strong Cloisonné small Hummingbird on turquoise paper, using VersaFine ink - Onyx Black, and cut it using Michael Strong Mini Wings Metal Die Cutters - they cut like butter! I added a tiny bling for the Hummingbird's eye. 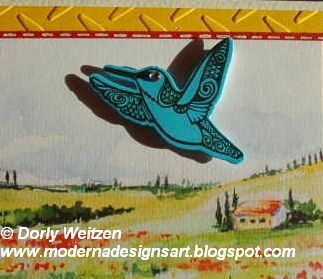 The Hummingbird was glued 3D with foam tape for extra dimension, so when you look at the card from its lower view you can see the bird's shade - it seems to be actually flying in the air. 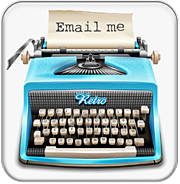 Love your background for the cute hummer Dorly...well done! Great way of showing the shadow of the bird. Dorly, I'm so glad you are creating cards once more. As usual, this one is a winner!! I like the dimensional look of of the hummingbird.